The Lake County rockhounding sites are known for their great deposits of rocks and minerals, attracting thousands of rock collectors each year. Some of the areas are located on the public lands managed by the Bureau of Land Management (BLM) and U.S. Forest Service. Also, there are privately owned mines, open to the public for rockhounding for fees. If you travel east on Highway 20, turn south to the dirt gravel Obsidian Road (BLM Road 6540) just before milepost 77 and drive for about 2-3 miles. The main Glass Butte Obsidian deposit is located on the left. On the right, you can find red, black, snowflake, lace and gold sheen. Continue driving on the dirt road, turn left and go around Little Glass Butte and then north. You can find excellent material along your way including red, midnight lace, silver sheen, and rainbow sheen. If you head west on Highway 20, you can take the road between milepost 82 and 81 and travel south and then turn right toward Glass Butte Obsidian. 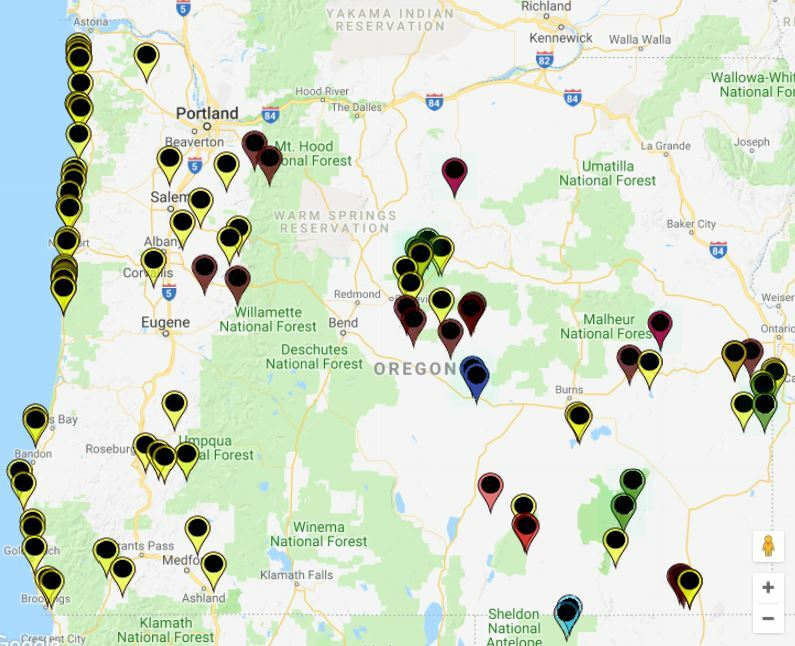 Located off Highway 20 between milepost 75 and 81, Glass Butte and Little Glass Butte are the best place in Oregon to find gem-quality obsidians. There are numerous spots, several gravel roads in this area where you can find a variety of obsidians including exceptional gold, silver, rainbow, red, black, mahogany, lace, and fire sheens. Also, you can find large pieces of double-flow obsidians. Warning! Edges of broken obsidians and chips are sharp. Use gloves and eye protection. Be prepared in the case if a brittle obsidian glass damages tires; have a spare tire or a tire repair kit. Tools: Not allowed. Surface collecting only. Road Access: Some roads are maintained. Seasonal road closure. Four-wheel drive vehicles with high clearance are recommended. Flook Lake. 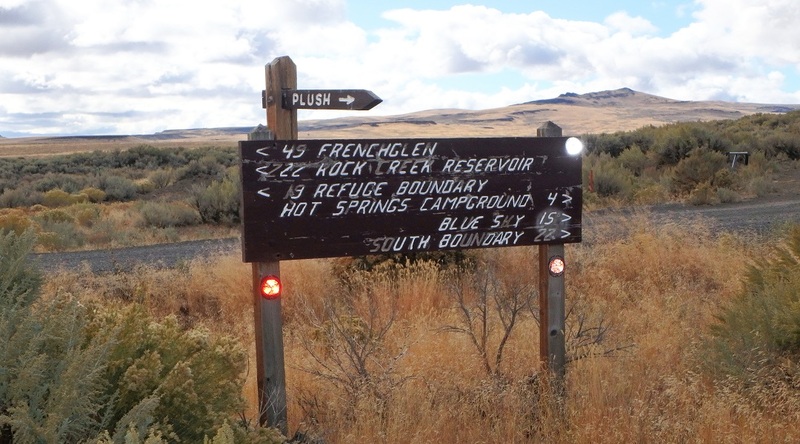 From the north end of Plush, turn on Lake County Road 3-12 or Hart Mountain Road toward Hart Lake and Mountains, continue 23 miles to Refuge Headquarters (the road is mostly gravel). Turn slight left onto Frenchglen Road and continue 4.6 miles, then keep right and go 2.1 miles to Flook Lake Road. Turn right onto a dirt Flook Lake Road and drive (in the road is dry) 1.1 miles to the edge of the Lake. During wet weather, the road is getting muddy and may become inaccessible. Rockhounding is permitted in the Hart Mountain Antelope Refugee for surface rocks collecting only. Do not to exceed seven pounds per person per day. Digging with any implement and blasting is prohibited. Always check up-to-date regulations and current conditions. Other Hart Mountain rockhounding collection sites: the western side of the Warner Mountains, DeGarmo Canyon, and Arsenic Canyon. The public collection area is marked by orange plastic posts. Within the public sites and nearby there are private mining claims. Before collecting sunstones, make sure you are within the public collection area.